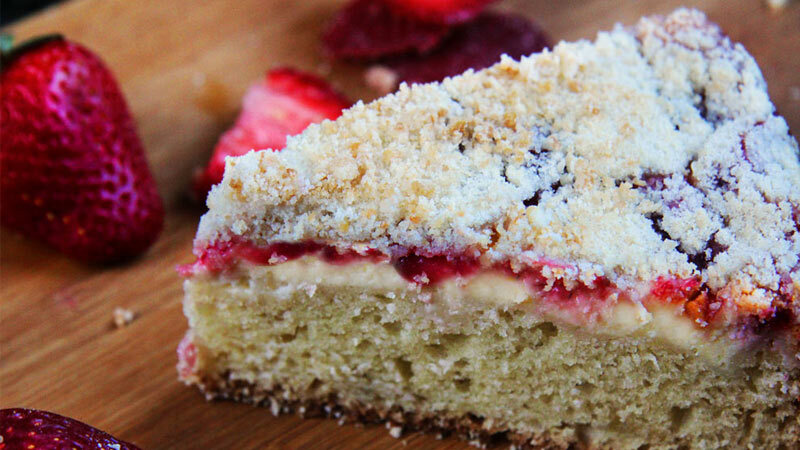 With strawberries in season, now is the time to make this delicious and oh so moist cake. Of course, this can be made with any fresh fruit really but the strawberry version I had recently at a nearby Ribbon Ridge Winery was scrumptious, so much so that I asked if they’d share the recipe. Lucky for me they agreed to! Serve with WildAire 2014 Open Claim Vineyard Chardonnay or our 2010 Dessert Wine for a really rich treat. Preheat oven to 350F. Grease 10×12 baking dish. In a large microwave safe bowl, combine milk and oats. Microwave on high 5-6 mins, stopping once to stir. Leave oatmeal to thicken/cool on counter for 8-10 mins. Stir in cake mix into cooked oatmeal until smooth. Mix in eggs, melted butter, and salt. Batter will be quite loose. Pour batter into prepared baking dish. Scatter sliced fruit/berries on top. Bake until center is just set, 30-35 mins (will seem under cooked). If you make the cake the night before it tends to be more like a bread pudding rather than the custard it becomes once set. Serve as soon as possible right out of the oven; warm and gooey.